Rate this Article Looking for a mobile slot game to keep you occupied over the holiday season? We've got some Game recommendations for you! Ho ho ho holidays are comin’, and to celebrate we’re taking a look at the very best festive fun to be had—along with merry money of course—by playing the best mobile slots games with added, special Christmas themes. So, while the chestnuts are roasting on that open fire and you’re waiting for the turkey to get stuffed, you can play along with the following yuletide slot games that are specially built for your Android or iOS smartphone this coming season. Remember, these are real-money mobile games (meaning, not for play money), some of which you can find here. What follows are all genuinely festive slots that celebrate all the joyful season has to offer and are available to play on mobile. We hope you enjoy. 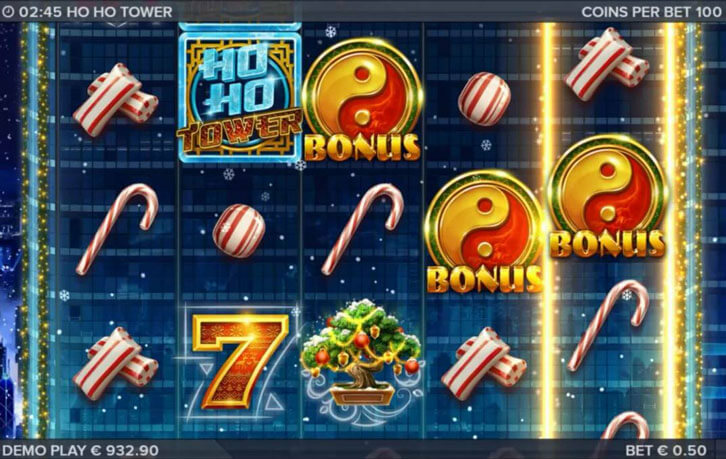 First up, we bring you the 99 pay line slot, “Ho Ho Tower” by Elk Gaming which is a yuletide version of the Hong Kong original. This is a non-traditional festive online slot that is set among the high-rise towers of Hong Kong. But, to add a festive theme, symbols of candy canes and presents are all included, together with snow, yin and yang symbols and bonsai trees. As for the mechanics of the game, the maximum jackpot is 1,061 times your bet, and you can bet from 10p all the way up to £50 a spin. The Ho Ho Tower logo is the wild symbol, which, when it appears, will randomly transform symbols into others to help you make that all-important combo. Four or five of the aforementioned yin yang bonus symbols will activate the Wheels of the Sky Bonus game where there are three bonus wheels; the aim is to reach the third and final wheel to win the big prizes. As we approach the festive season, another one of the best themed mobile slots is Pragmatic Play’s astutely-titled “Santa”. Playable from 20p to £100 per spin, the top win is 400 times your bet, which is provided by old Kris Kringle himself (who has handily supplied stacked wilds over 40). Set across 5 reels, this festive beauty includes a Pick Me bonus game where you choose your presents to win the jackpot, which could be as much as 250 times your stake. As for free spins, you get five—but remember that the Santa wild can spread across 4 reels on each of these free spins. Bringers of yuletide joy, NetEnt, bring you the gift of “Secrets of Christmas”, a seasonal spin on their brilliant “Secret of the Stones” online game. As such, this is a 5 reel and 25-pay-line video slot, but with Santa, bells, candles, milk and cookies and other Christmassy stuff acting as symbols. As with the game discussed above, Santa is the wild symbol and can switch all other symbols, save for the scatter, and can randomly appear anywhere during the free spins feature. Here, the scatter symbols are represented by toys, and if you land 3 or more anywhere across the reels, your free spins will be triggered. Head to Lapland and join Father Christmas and his helpers in “Fat Santa”. Shaking his belly like a bowl full of jelly, old Saint Nick has certainly put on an extra few pounds; and its “pounds” you can win, as this 5-reel, 5-row slot makes for rewarding festive fun with its 50 pay lines. The aim of the game is to help Santa locate and eat as many pies as possible. For every set of 5 pie wilds scoffed, the wild symbol (Santa) grows in size up to five times. Furthermore, each increase in size brings with it additional free spins. Players can bet between 25p to £25 as they look to line up Christmas ornaments, as well as snowmen, reindeers, Christmas elves and Santas. And it’s fat St. Nick who is the most lucrative find here, as he yields a 20-times-your bet win rate when scored across a full pay line. Keep an eye out for the sleigh feature that comes every so often, which, when triggered, will launch Santa and his reindeers across the screen chucking wilds at the reels as they go. Finally, we bring you “Deck the Halls” by Microgaming, which is a Yuletide-themed slot that features 5 reels and 30 pay lines. The Christmas spirit is brought to us by way of Christmas carols and assorted seasonal items such as a baked turkey, Christmas trees, a fireplace, gifts, Santa, reindeer, stockings, and Christmas lighting. Your wild in this game is the Deck the Halls logo, and it will substitute for all other symbols (other than the scatter, which is played here by the bells). The game’s logo can reward you with a top payout worth 4000 times, while the bells will bring you 15 free spins should you line up three or more. So, with these Christmassy slot games, you really cannot go far wrong this festive season. Should the turkey take a little longer than expected, or that one annoying dinner guest who keeps on sharing a story too many, you know what to do. Just pull out your phone and get spinning!